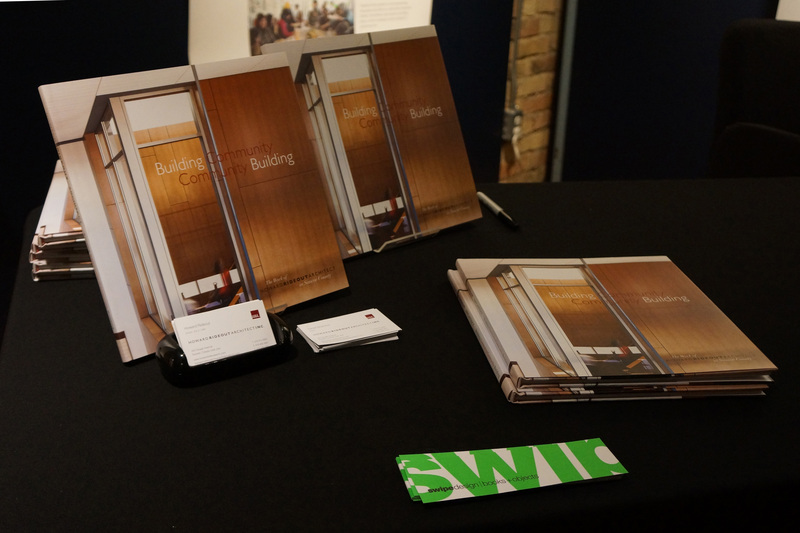 Building Community/Community Building | Howard Rideout Architect Inc.
HRA began the New Year (on the eve of the Chinese New Year) with the launch of our book, “Building Community/Community Building,” which documents our work in Simcoe County. 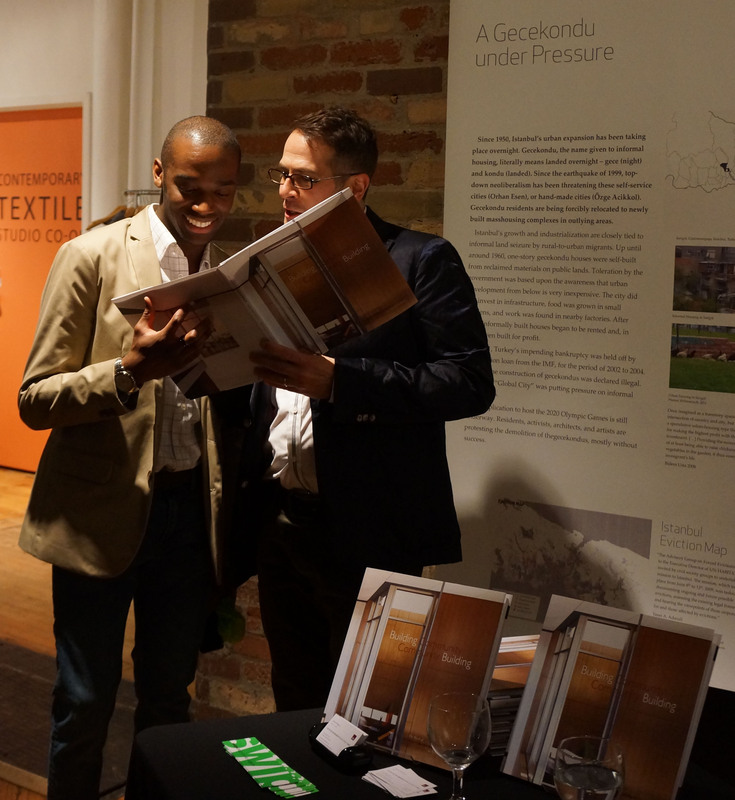 We were happy to host a hundred people over the course of the evening within the Urban Space Gallery. Mid-way through the evening, Kyle Winters introduced Kevin Stolarick, research director of the Martin Prosperity Institute at the University of Toronto’s Rotman School of Management, who discussed the development of small towns, specifically Midland, and some of the work his organization has undertaken to understand the creative economy of Ontario, not just within the large metropolitan centers that seem to attract the bulk of the “creative class” but for these smaller centers that have been struggling within the global economy. In his presentation, Kevin detailed a section of the recently released report entitled, “Benchmarking the Creative Economy in Rural Ontario” where Midland was selected as a representative town within the Central Ontario Region. In this report, Midland was sited as “a unique rural town with a balanced labour force and emerging competitive advantage in the arts and culture sector, which will help to position Midland for success in the creative economy.” Kevin stated that through projects like the Midland Cultural Centre, both the town and region of Huronia will have a competitive advantage in these sectors, ensuring the future success of the region. Kevin then introduced Howard Rideout who spoke of his personal connection to the region and how the book was a reflection of his many years of “Building Community” within Simcoe County and Midland. Howard’s discussion focused on how he had become deeply attached to the region and it’s people through his architectural work. 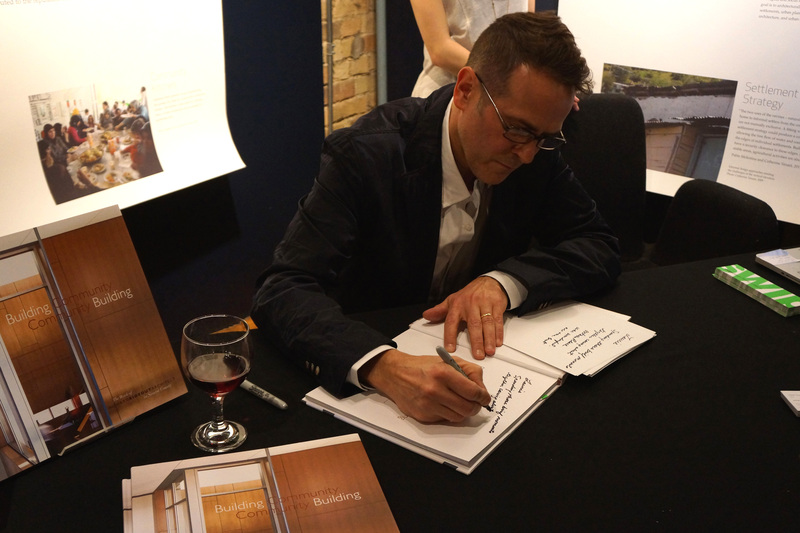 He discussed his understanding that being awarded the design of the Midland Cultural Centre (MCC) was a unique opportunity for a small architectural practice. With this opportunity, HRA engaged in numerous events throughout 2012/2013 that marked amazing moments in the building’s calendar. The exhibition of the firms work in the art gallery, during the summer of 2012 (upon which the book was based), was the beginning of a series of events that marked the calendar that year, from the presentation Howard had at the opening celebration of Quest Art School + Gallery where he described the evolution of the building from its original concept to final completion, to the Salon Midland held in June. Later in the year, these events included the Prosperity Summit held in the building where Kevin Stolarick presented the a fore mentioned report to the regions leaders. After this brief presentation, Howard felt it most important to thank all of the team at HRA for their great work over the last 14 years and toasted to the amazing friends, clients, associates and guests that filled the room with support and warm thoughts on this chilly evening!